Thursday 1st December 2011, Broadway Cinema, Nottingham. The 4th IWPA Tournament Winner Mr Marc "The Machine" Biskup of Germany. 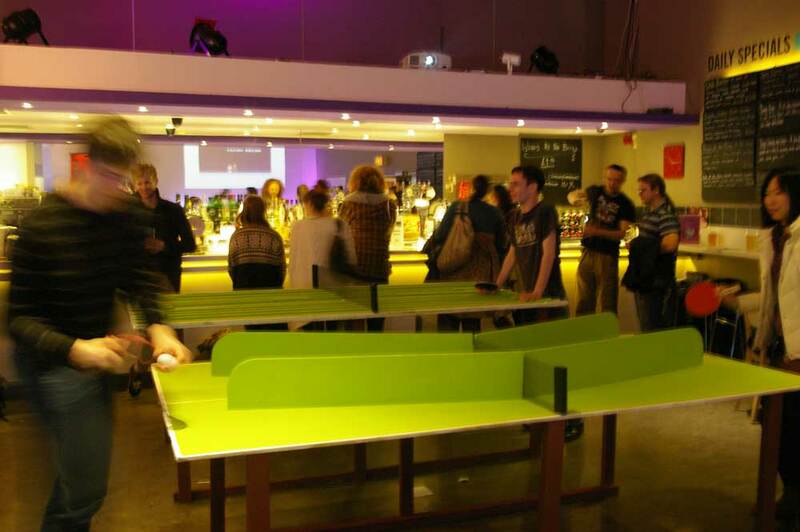 The 4th International Wrong Pong Tournament took place on the 1st of December at Broadway Cinema, Nottingham as part of Show and Tell. 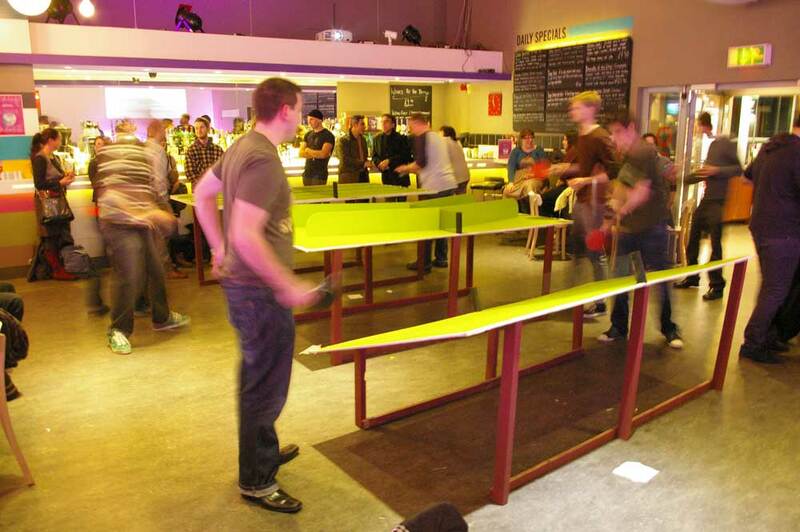 The cafébar tables were cleared out at 8:45pm and three Wrong Pong tables brought in. 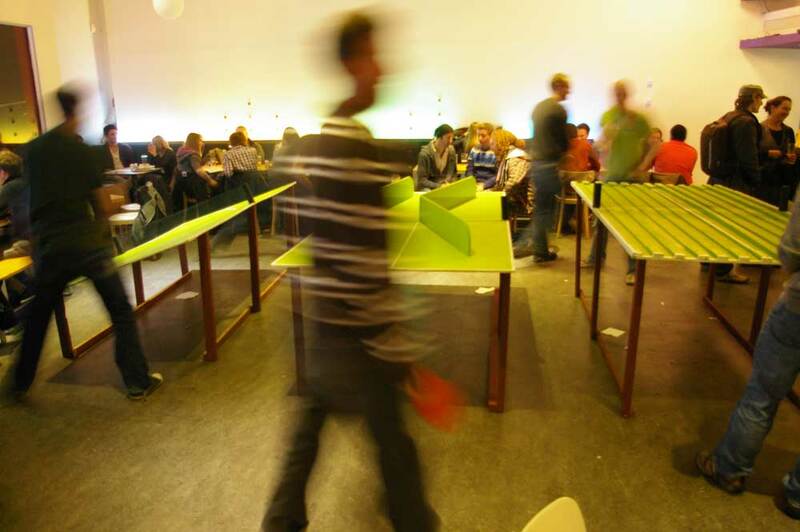 We started with a knockabout for people to get accustomed to playing on the tables, and then began the tournament proper. 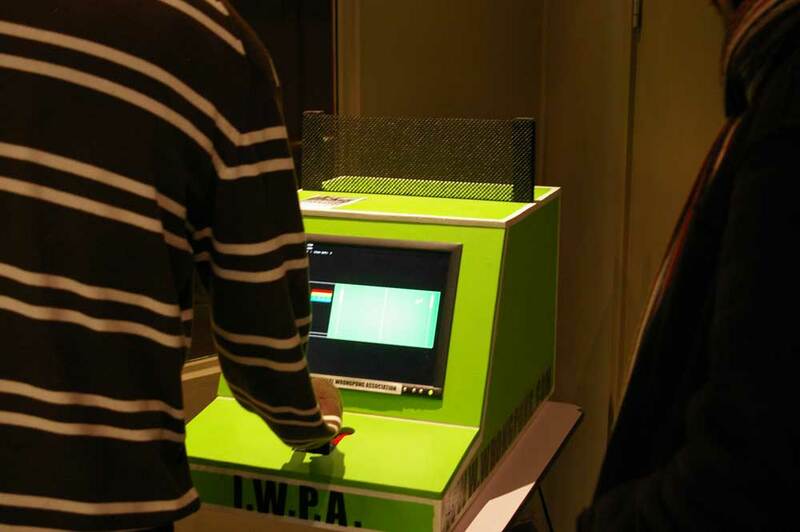 As well as the three tables in the cafébar we had the new Wrong Pong arcade machine (programmed by John Perry) set up in the foyer. The night was expertly compèred for us by Andy Batson, who gave a wonderful play-by-play commentary and brought a sense of order to the night. 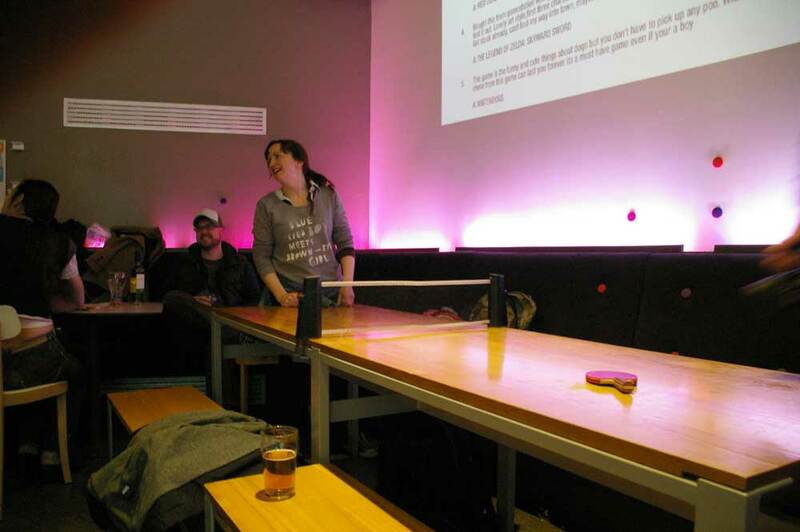 Also joining us on the night was Carolynn Ryan of the English Table Tennis Association, who came along to the tournament with roll-up nets that fix to any table to convert it to a ping-pong table, and two tiny bats. 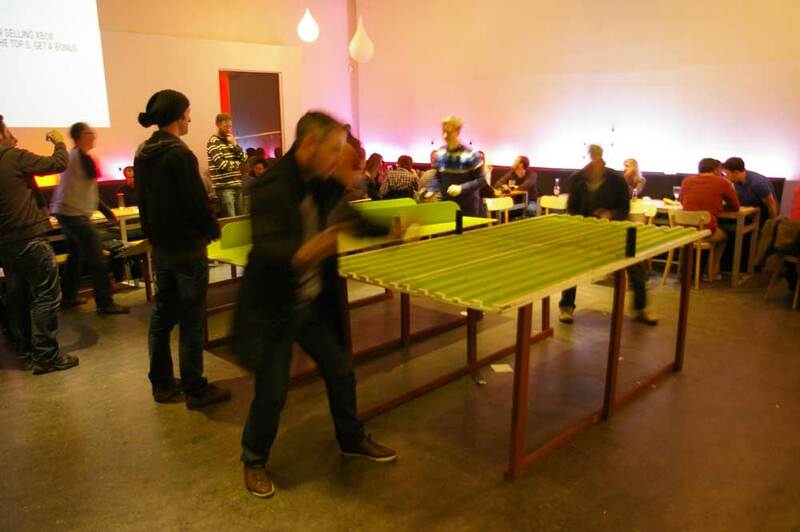 Using her net we instantly made one of the narrow Broadway cafébar tables in to a "Long Pong" table that was used throughout the evening. 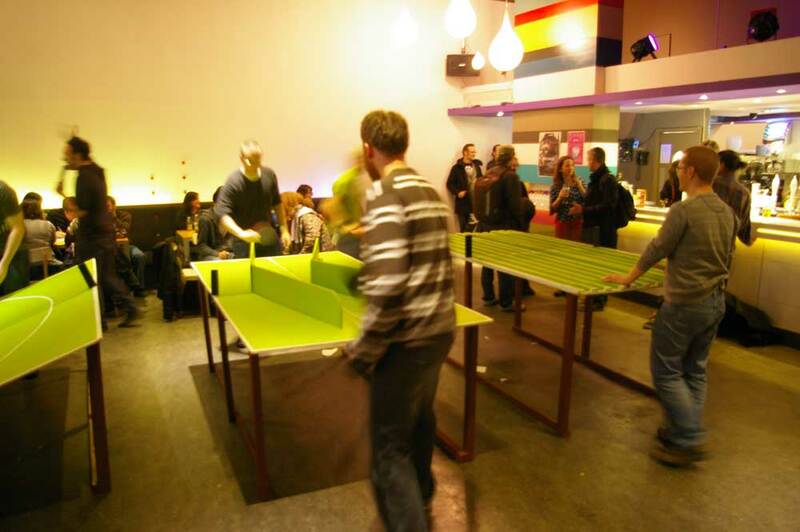 There was a good crowd of players of every skill level, but after a frenetic night of non-stop Wrong Pong action it was clear there were only two contenders for the Wrong Pong crown - Mr Marc "The Machine" Biskup of Germany, and Mr Paul "We Forgot To Ask You Your Surname" Something. These were no ordinary men; these were champions who faced one another like Olympian Gods playing sport not with ping pong balls, but with the very lives of mortal men. With a shout of "Come On!" the compère rallied the crowd and the showdown match began. Marc Biskup took the first game, played on the Simple table, then Paul came back with a win on the Tricky table sending the match all the way to a nail-biting third deciding game to be played on the Expert table. The compère caught the sense of nervousness and tension in the room with the words "I have literally wet my pants with excitement." It was a tense third game. The Expert table is a fickle mistress; one moment speeding your returns far out of your opponent's reach, the next biting at you with vicious teeth. An expectant hush nearly fell upon the room. One ball sped off to the right, the next to the left. A glorious return, an unexpected recovery, a tragic miss, an unreturnable service, and... a winner! 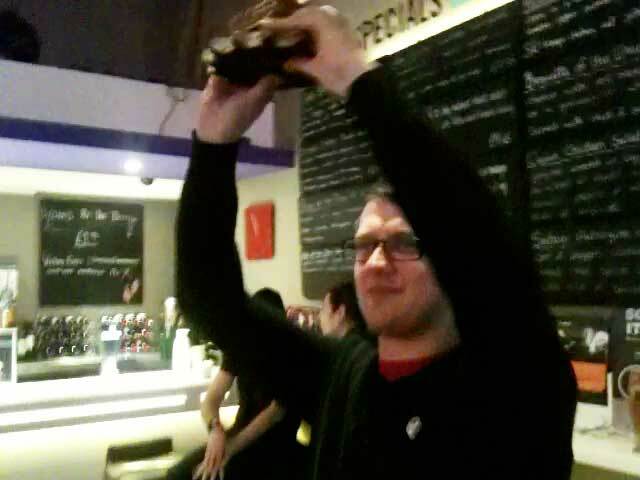 Our new International Wrong Pong Champion is the tremendously sporting Mr. Marc Biskup of Germany. Congratulations! To sum up; Broadway was a smaller venue than we have played before so the tables were a little cramped together, but because of this the atmosphere it created was wonderful - everyone was laughing and saying Excuse Me and bumping shoulders and making friends. It was a great night and we'd like to say a huge Thank You to Mat Trivett and Broadway Cinema for having us, and to Andy Batson for doing a magnificent job compèring the night. Thank you! To Mat Trivett's Show and Tell website! To Andy Batson on Twitter! 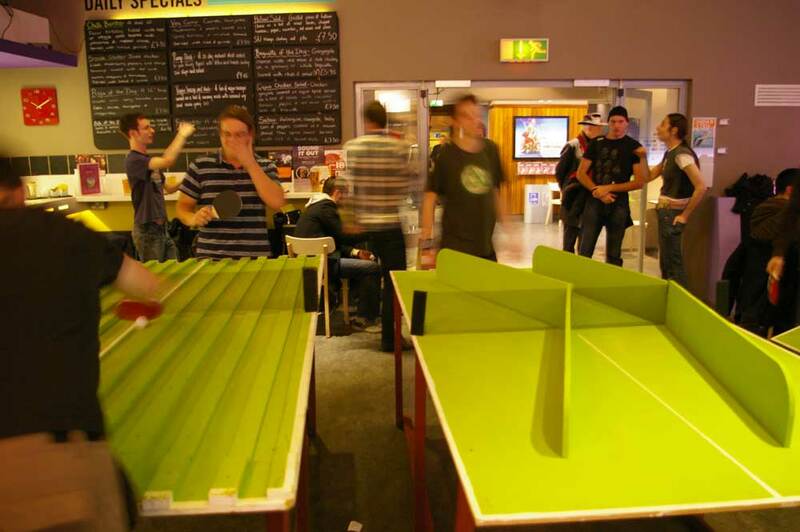 To the English Table Tennis Association website! To the Broadway Cinema website!